This Sock Snowman would be a lovely visual arts lesson to do in the weeks leading up to Christmas or at any time during the winter months. It looks pretty straightforward, but then again …..!! This is a simple short song for pupils, particularly younger pupils, to learn. It’s in the form of a conversation between Rudolph and the Snowman. Lyrics are displayed on screen. Part 3 of the video telling the story of Frosty the Snowman. Part 2 of the video telling the story of Frosty the Snowman. Part 1 of the video telling the story of Frosty the Snowman. The Snowman is a children’s book by English author Raymond Briggs, published in 1978. In 1982, this book was turned into a 26-minute animated movie by Dianne Jackson for the fledgling Channel 4. It was first shown on Channel 4 late on Christmas Eve in 1982 and was an immediate success. Watch this well-known video of the song “Walking in the Air” from “The Snowman” book by Raymond Briggs, published in 1978. 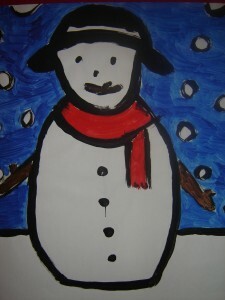 Create a seasonal picture of a snowman.